It finally happened. The thing that all horn players or really, all musicians fear. 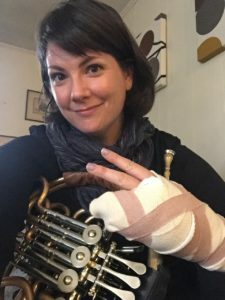 The inability to play my instrument due to an injury, disease, or handicap. I broke a a bone in my left palm. I. BROKE. A. BONE. IN. MY. LEFT. PALM. (the all caps followed by periods was for dramatic effect… did you feel it?) I can still feel it. It hurts. It feels numb. Same thing, really. It’s so many emotions wrapped into one piece of prose with a pragmatic view. I love the horn. I hate the horn. I can play it well, but I don’t think I play it well enough…yet. It’s a long story, but I hope I can help any who care to know it. I was a great beginning clarinet player in the second semester of my 6th grade year. I learned the fingerings, all 12 major scales (what! ), and showed my directors that I had a fervor to be great. They believed me and offered to switch me to the bassoon or french horn. Now that I know what I know, they possibly thought I could handle the intricacies of those instruments. Young horn player need to have a great work ethic and be comfortable with delayed gratification as it may be a while before correct notes come forth with a beautiful sound. And, yes, bassoonists must have a similar tolerance for delayed success and be able to learn how to construct their own mouthpiece, day in, day out. So, what did I do? 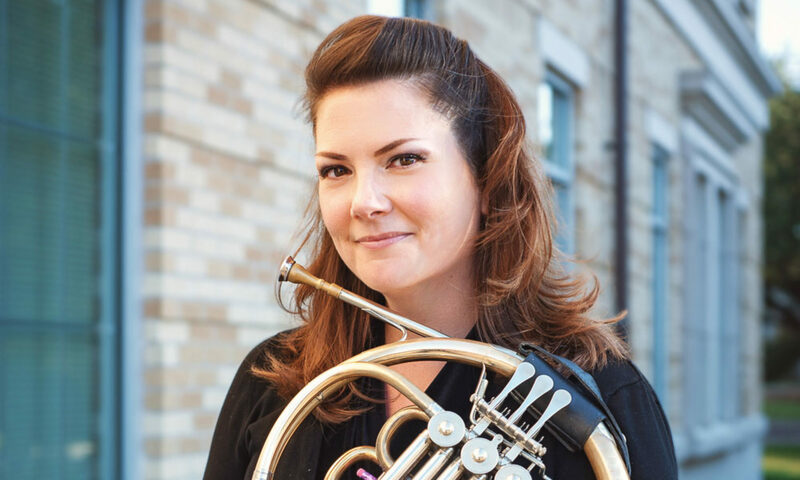 I chose the french horn because I had no friends who played it, and I was eager to do something on my own. I now feel I chose the path of least reed-sistance. Get it? Ah, that’s okay. Horn players are hilarious, unless you aren’t one. I decided to study music and major in French horn at the University of North Texas, upon graduation at Aldine High School in Houston, TX in 1997. I really wanted to be a periodontist after spending my sophomore and junior summers as a dental assistant. I loved watching a patient transform from an infected mess to a happy, healthy, toothy wonder! BUT, I also had another talent that my band director, Jeff Laird, begged me to take notice of. I could play the horn well- for a high-schooler. Dr. Laird urged me to take lessons with Jeff Solomon my senior year of high school, and that led to playing with the Greater Houston Youth Orchestra. My first orchestral performance of note was Shostakovich 5…what?*$%^! I was surrounded by great horn players and even experienced sectionals led by THE Bill VerMeulen. I didn’t really get what that meant at the time, but I could feel it was something special. So, I decided to major in music at the University of North Texas in 1997 to see what this would turn into. I studied with Bill Scharnberg. I started at UNT with relatively NO ear training or theory experience, compared to my classmates. I swear, they all had perfect pitch, perfect hearing, or were just perfect in every musical way. It was a daunting task to match them, to say the least. I worked tirelessly to pass my my Aural Skills classes with a ‘B’ and hustled to get an A in Theory. You should know that a B was hard for me to swallow after having worked so hard- I often was in the practice room until 2am working on my 8:30am quiz material! Fun fact: I once took a dictation quiz on a 12 tone row in which the 1st pitch was given, and the next eleven were to be filled in. I MISSED ALL 11 PITCHES! My boyfriend at the time (now husband) got 2 of the 11 pitches correct, and I was so upset!!! He was a percussionist who routinely banged on things in a rhythmic, but musical fashion and got a 25%, but I was purely melodic and musically trained and got a 0%. ZERO. That hurts. Still upset about that one. The horn players at UNT were all accepting and inviting. I never felt like I didn’t belong or like I shouldn’t be at UNT when around them. That was a nice change from Aural Skills! I felt encouraged, inspired and like I belonged. That’s important. (This is something I strive to achieve un my own teaching: encouraging, inspiring, and belonging). I always looked up to my peers and elders. They had something to offer, no matter if it was musical, academic, or social. If I could learn from them, I could grow and become a better person. I spent all four years studying with William Scharnberg and learned how to work hard/smart, be a good person, and use better grammar! Graduate school. I played the risky game of putting all my eggs in one basket. I only applied to one school and was fortunate enough to get in. I enrolled in SMU’s Meadows School of Music in the Fall of 2001. I studied with Gregory Hustis, the Principal Horn of the Dallas Symphony. I was able to graduate from UNT without any debt (I had full tuition and worked to afford living costs), so I decided to take out a modest loan to cover rent and living costs while attending SMU. I felt it was supremely important to focus on practicing and studying to get the maximum benefit from graduate school. This turned out to be a wise choice and overall sound investment. While I studied with Greg, I learned a great deal about sound, equipment, and musical intention. The summer after I graduated in 2003, I was accepted to the National Repertory Orchestra and enjoyed a fantastic summer making music with the nation’s top young orchestral players in Breckenridge, CO. A better graduation gift, I could not imagine! There are a ton of details I’m skipping (about 14 years worth), but let’s just say that I start teaching a ton of private students, working at TrumCor mutes, and freelancing in the DFW area in 2003. This was/is my life and career. A trifecta: teaching, playing, and managing. These are all valuable skills to develop and foster. I eventually began to teach at the college level while continuing to oversee TrumCor and freelancing. As I grew in experience and age, my factions also increased in demand. Amidst it all, I joined a rock band, became a mother, lost my first dog and gained a new one and became a full-time college professor. It became a busy, busy, wonderful music career in all areas of performance, teaching, and administrative skills. I could not be doing more of the very thing I sought to achieve in the beginning of it all. AND THEN I BROKE MY HAND. An ordinary trip and fall moment. Except, it was extraordinary. The kind you don’t shake off or just forget. I tripped, fell, and braced the impact with my left hand/left leg because I am right handed. I quickly got back up but felt dazed and in shock. This was an unfamiliar feeling, so I did my best to just let it happen and ‘go with the flow’. Any experienced musician will attest to the art of ‘going with the flow’ in music and in life. I looked at my left hand and saw and felt that it was weak, but it moved as I wished it to, so I was somewhat hopeful. 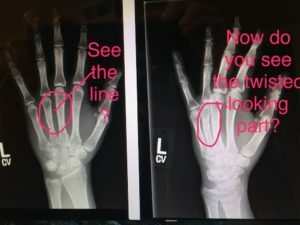 The only catch was that when I moved my ring and pinky fingers, it made a clicking/popping sound that could really only mean one thing…I needed an X-Ray to determine if there was a fracture. I picked my son up from school, and we then went to the MedPost Urgent Care facility in our neighborhood. The X-Rays showed a fracture, and I was immediately struck with fear, sadness, anger, and hopelessness. I had a service booked in 2 weeks. How would I play? I couldn’t. What about Easter? HornFest? Opera? Teaching? Perhaps I could still teach but, but, but, I can’t play! There were tears. Many tears. And, I was scared. More scared than when I looked down at my hand just hours earlier thinking maybe it was broken. I was scared for the entire lifetime I had poured into my career of teaching, playing, and managing. Suddenly, it all seemed in jeopardy. But, I now believe it to be the beginning of the rest of my career. The day that I started taking nothing for granted and stopped holding myself back. It hurts just looking at that picture, even though you are whole again! So glad it healed. Everything a teacher experiences becomes a lesson for students…still, I’m sorry you had to go through this!